At the end of the nineteenth century, the Jesuit Camille de la Croix, archaeologist scholar of his time, discovered on the site of a large establishment Gallo-Roman baths. Nothing remains of the first church dedicated to St. Germain, bishop of Paris in the sixth century. The oldest parts of the present church does not go back beyond the twelfth century and relate the bedside. 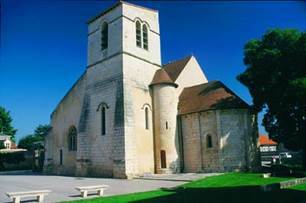 Successively, the thirteenth, fifteenth and sixteenth centuries have made alterations evidenced the tower, the nave or small Renaissance chapel adjoining the south side. Abandoned the worship from the Revolution, the old parish church known then various functions, it was even planned a time into the school. Its acquisition by the City of Poitiers in 1990 he issued a new identity restored, integrated into a comprehensive urban project (development of a place by the plastic Narboni) which connects the Conservatoire de Région, it was transformed into an auditorium.